February may be the shortest month, but it is also the busiest. With Valentine’s Day, two president’s birthdays, Chinese New Year and Ground Hog Day, February always promises excitement! Ms. Kristin and Ms. Charlynn continue to help our youngest children with the exciting process of learning. The children will explore the concept of opposites as they compare and contrast the world around us! The three-year-olds go on a safari this month and study the animals at the zoo. As the month goes by, they become experts on animal features and behavior. Don’t forget to ask your children about the animal names in Spanish as well! Our four year old classes are saddled up and moseying along as they learn about horses, cowboys, and rodeos during the Wild West unit. This is an exciting unit that combines the factual information on horses with delightful stories of the American cowboy. In keeping with their developmental levels, the fours will enjoy stories and songs about the Wild West. The unit ends as the children enjoy a “rodeo,” BBMS style! Ms. Moesta and Ms. Brantley will lead the PreK classes in covering the hodgepodge of February–Ground Hog Day, Lincoln and Washington’s Birthdays, Valentine’s Day, and Chinese New Year. 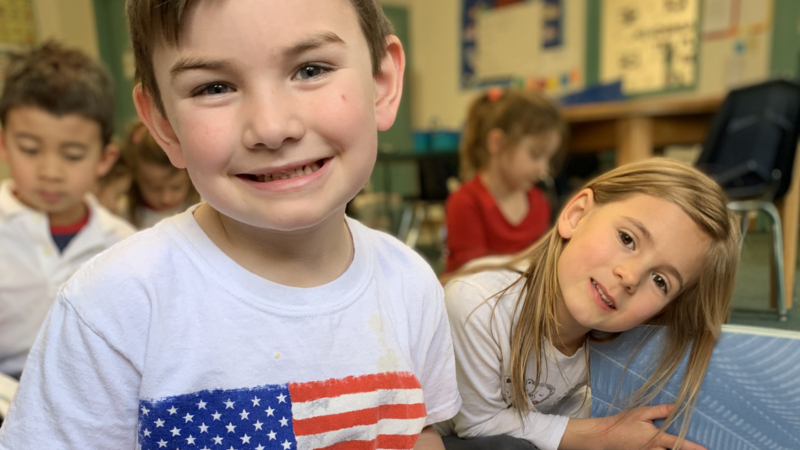 It’s a great time for the children to learn a bit about our country’s history, the pledge of allegiance, and those anecdotes about George and Abe. Busy! The kindergarten classes take a trip back in time to the age of reptiles to study dinosaurs. These budding paleontologists learn to identify close to twenty-five dinosaurs before attending a dinosaur hunt at the end of the month. This is one of our favorite studies, and the children love it. Much time is also spent working on hand writing, math facts, and the concept of fractions. Valentine’s Day, with its message of love and friendship, is special to children and to BBMS. Each class exchanges valentines and has a party. Enclosed is a list with the number of children in each class. Please send in valentines for each student in your child’s class, and we’ll take care of the rest. The teachers have requested that you NOT “address” the valentines–just sign them with your child’s name. This way the children can easily pass them out. Registration for next year is going great! It is satisfying to know so many of you are pleased with BBMS’s program. Thank you for all your support and cooperation. Without your smiles and encouragement my job would be so difficult. Instead, it’s a joy! As of February 1st, registration is open to new families. If you intend to register your child for next year and haven’t yet done so, I urge you to turn in your form along with your registration fee immediately. Several classes have already closed and availability is very limited in others. Summer registration forms and more info about the program will go out the beginning of March. We will have two, three, and five-day programs, both half and full day. This is a great time for the children to stay active and continue their academics between school years! The summer offers nautical studies, splash days, field trips, gardening and lots of fun and games! Be sure to check our website at www.manorschools.com for any school closings or delays. You will also get an email as soon as a decision is made. We typically follow the public school’s closings initially. We try our best to keep children, parents, and our staff safe during these times. I want to thank you all for your support within our community! I can’t tell you how many times we get new families looking at Broad Bay Manor after getting referrals from current parents. Hearing this makes my heart happy. BBMS is lucky to have such supportive and involved families!